Cooking Class in the kitchen of Hacienda Petac. Inside a suite at Hacienda Petac, a plantation in the Yucatan. 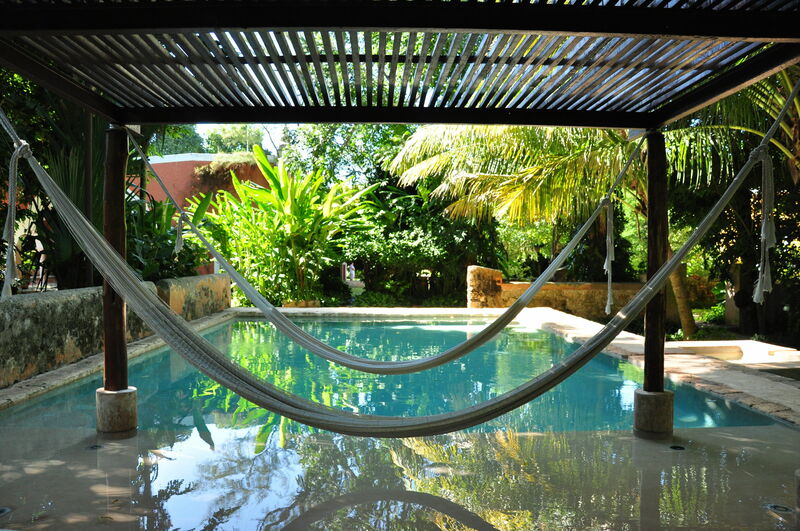 The shaded pool at Hacienda Petac is the place to relax after a morning of cooking. The traditional terra cotta stucco facade of Hacienda Petac. Hacienda Petac, a traditional plantation in Mexico’s state of Yucatan, is providing a unique group opportunity to learn more about Yucatecan culture through its cuisine and at-home customs. If you’re imagining a family reunion in a luxurious home away from home, with space, privacy and a hassle-free environment, you’ve come to the right place. Worried about what everyone will do? Shopping, learning, cooking, serving and dining together makes for the perfect family getaway for those with older or already-grown kids. 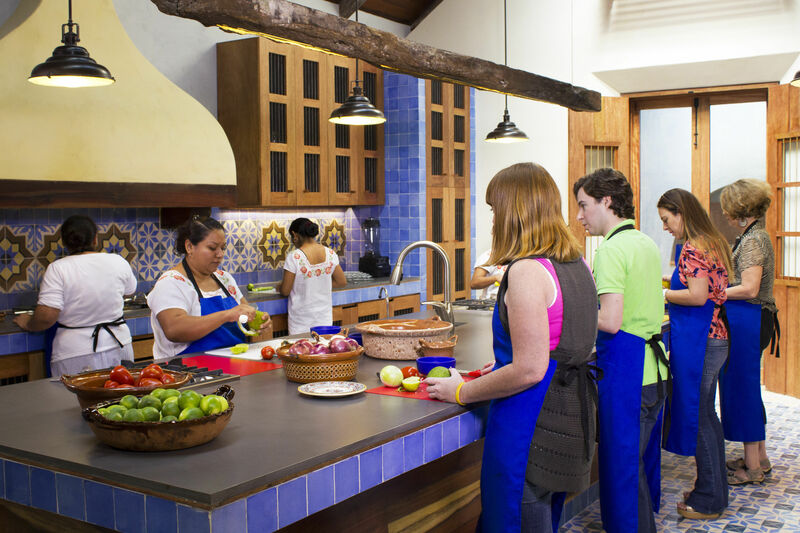 The Yucatan Cooking Class package is designed for a group of at least six who will enjoy the luxurious but classic rooms — and stellar guest service — on a former henequen plantation. The main hotel is at the heart of 80 acres of private gardens, with a large private villa and some other buildings on the peaceful grounds. It’s really a place to kick back and enjoy eachother, but for the restless, there’s a heated pool, Jacuzzi, a small spa and gym, a game room and a media room. Guests also have access to free WiFi and daily laundry service (if you get hot in the kitchen). Located just 30 minutes from Merida International Airport and a four-hour drive from Cancun, it’s easy for everyone to get to, and in a region rich with Mayan culture and historical treasures. For guests who wish to explore the diverse attractions of this region, several of the world’s finest Mayan archeological sites, wildlife reserves, and underwater caves are within an hour. This six-day edutourism vacation includes artisanal cooking lessons and local tours designed for small groups, family and friends. You’ll shop the mercado, taste las especias, drink los jugos locales and even study the table designs that make the Hacienda Petac’s communal dining experience “a celebration, not just a meal” as they say. For reservations and information, call 800/783-6904 or 203/274-7375, or visit the Hacienda Petac website. The package is valid through 2015. If your family is doing a lot of travel within Mexico, you can also contact the Epitourean travel agency, whose agents offer a variety of Edible Destinations tours, and can assist with all your travel plans in addition to booking the cooking school. Please share recipes when you get back!